The Ackland Art Museum is based at the University of North Carolina at Chapel Hill and has been one North Carolina’s most significant cultural resources since 1958. Serving a broad range of local, state, and national constituencies, the Ackland Art Museum features a comprehensive collection of over 18,000 works of art, including significant collections of European masterworks, Asian art and twentieth-century and contemporary art, as well as works of art on paper and North Carolina pottery. The Museum’s collections are showcased through exciting exhibitions through the year, as well as special and traveling exhibitions and shows. Established by the bequest of William Hayes Ackland, the mission of the Ackland Art Museum is to collect, preserve, and present a range of inspiring art to the both the students and educators of the University and the greater public to inspire and engage critical and creative thinking. In addition to its acclaimed collections, the Ackland Art Museum is also deeply committed to education and to this end offers a variety of educational programs that that enhance learning for both adults and children, as well as events related to the exhibition, community, and university topics. The permanent collection at the Ackland Art Museum features a comprehensive collection of over 18,000 works of art, chosen for their outstanding quality and ability to convey the extent of human achievement in the visual arts. The collection includes significant holdings of European masterworks, Asian art and 20th-century and contemporary art, as well as works of art on paper and North Carolina pottery. Featured artists in the collection include Pablo Picasso, Albrecht Dürer, Kathe Kollwitz, Max Weber, and Jean-Honoré Fragonard. The Ackland Art Museum prides itself on having a collection of art that is well-suited for the diverse community in which the Museum is based and one which forms the foundation for the renowned exhibition program the Museum runs. The Ackland Art Museum presents up to 12 changing exhibitions a year, with over half the Museum’s gallery space dedicated to special, temporary and traveling exhibitions. These exhibits feature a broad and diverse stylistic range of art, from European Master paintings and contemporary American photography to Early Modern portraits and state-of-the-art video installations. Changing exhibitions feature works from the Museum’s permanent collection of over 18,000 works of art, which include ranging from ancient Greek vases to modernist Andy Warhol works. Studio Saturdays offer a variety of hands-on classes and activities inspired by works in the Ackland’s collections for all ages, while Art for Lunch offers an hour of inspiration and information with a packed lunch. Student programs include Ackland Study Sessions, Hands-on Art Classes for UNC students and conversational Encounter Art Tours. The Ackland Art Museum is located at the University of North Carolina at Chapel Hill at 101 S. Columbia Street in Chapel Hill, North Carolina. The Museum is open Wednesday through Friday from 10:00 am to 9:00 pm, Saturdays from10:00 am to 5:00 pm and Sunday from 1:00 pm to 5:00 pm. 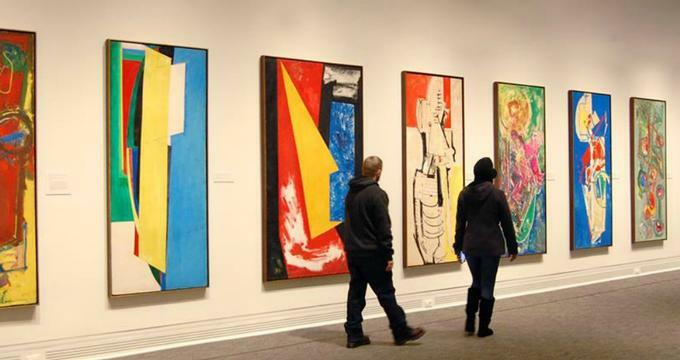 Visitors can explore the Ackland Art Museum’s permanent collection of art every Wednesday on free, 30-minute docent-led tours with an experienced guide. Tours leave at 2:30 pm from the visitor services desk in the Ackland’s lobby and no reservations are needed. The Ackland Museum Store sells a variety of items and objects related to the Museum’s permanent collection and changing exhibitions, including books about art history and criticism, artists’ monographs, jewelry and accessories, home décor, pottery, glass, textiles, children’s toys and books; and stationery.